In addition to the efficient geometry modeling capabilities, CAESES® offers integrated methods for automated design explorations and shape optimization. CAESES® contains State-of-the-Art optimization algorithms ranging from single-objective strategies for fast studies, to more complex multi-objective techniques, including response surface techniques such as Kriging and Neural Networks. Perfect to automatically vary and optimize the CAESES® models! Easily step through the different designs to look at the CFD results and the geometries, CAESES® manages the entire data for you and makes design studies incredibly easy! There is also a design viewer for side-by-side comparisons and robustness checks. You are not in the office and you want to know the status of your current optimization run? Then you will enjoy our convenient notifications that can be automatically sent by CAESES®‘ design engines to your mobile phone! Check out this post for more information. There is also HTTP-monitoring available to connect to runs through a browser. Interested in using surrogate models, i.e. response surfaces such as Kriging? Learn more. CAESES® gives you everything you need to understand your study, and to pick the optimal design candidates. CAESES® includes its own interactive 3D post-processing environment! Understand overall performance characteristics (e.g. resistance, pressure loss, lift coefficient, flow rates) or look at the details of the flow patterns (e.g. cut plots, surface plots, trajectories). 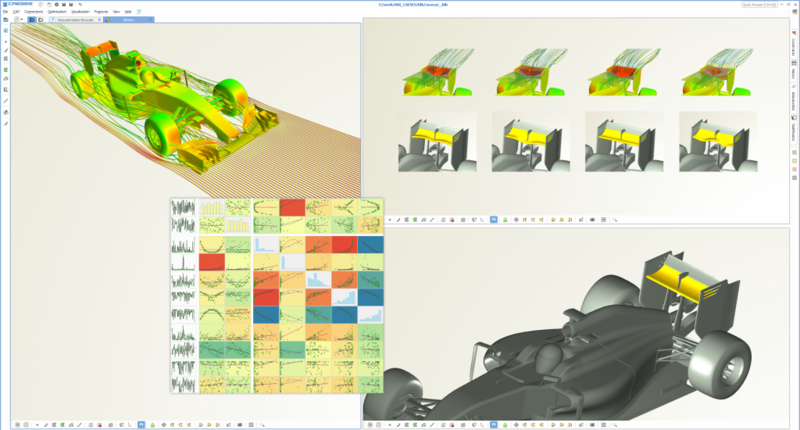 Compare all generated geometries and corresponding simulation results side-by-side in the design viewer! More information? Read this short blog post about visualization of best designs and pareto frontiers. Do you already use another optimization tool in your company, and you want to stick to it instead of using the inbuilt algorithms? No problem! For this situation, you can run CAESES® in its batch mode as your powerful CAD engine to generate geometry variants – driven by your optimization software of choice. All models are directly ready to run in batch mode. Furthermore, everything in CAESES® can be scripted, using an intuitive and easy-to-learn command language. There are add-ins available to plug-in CAESES® into the optimization products of our partners. With this integration, the parametric CAESES® models can be directly controlled through the user interfaces of optiSLang (Dynardo) and Optimus (Noesis Solutions). Benefit from the direct CAESES® connection for the ANSYS Workbench, to run your CAESES® geometry models in the background. Control and vary all the design variables from within the ANSYS Workbench user interface. More information can also be found in the article “Shape Optimization in ANSYS with CAESES“. Are you using the free optimization toolkit Dakota (from Sandia National Labs) in your department, or you want to introduce it? We have developed an easy-to-use wrapper for Dakota so that CAESES® interfaces with it. The full method set of Dakota can be applied directly within the CAESES® GUI, without learning additional software or using a console. This includes advanced sampling techniques and strategies e.g. for robust design optimization including surrogate models. CAESES® takes care of the entire variant and data management, there is no scripting etc. required. More information? Check out this short video, and this article about response surface models. CAESES® comes with an optional SSH Resource Manager, which is a separate piece of software. It is is a light weight grid engine designed to quickly enable CAESES® to start external simulations on remote computers based on the SSH protocol – with a single button-click, and from within the CAESES® GUI. 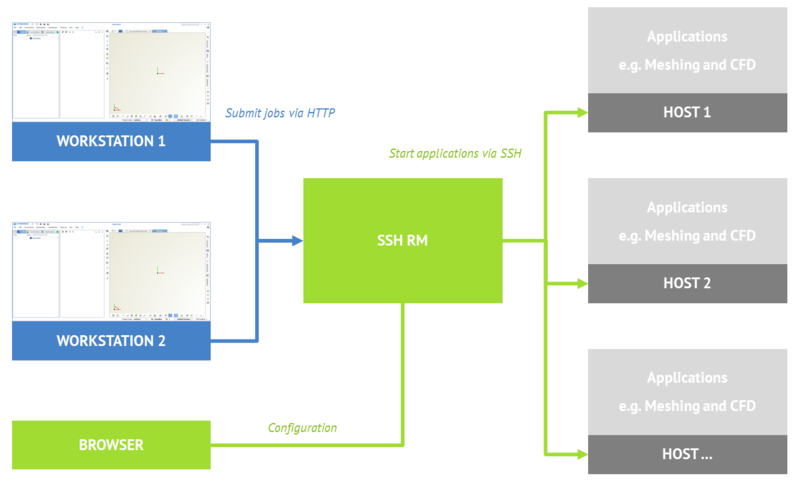 Using the SSH Resource Manager behaves the same as if the simulation was executed on the local machine. If you do not use a grid engine already, then the SSH Resource Manager can greatly boost your design studies and optimizations with CAESES®. The SSH Resource Manager is a platform independent program that can run on any operating system for which Java is available. It allows to reduce the idle time of software licenses and to utilize available hardware resources fully. Additionally, it enables CAESES® to pass operating system boundaries, when, for example, the software you want to integrate has to run on a certain operating system but your CAESES® users work on a different operating system. Save loads of time by learning and using only a single tool that exclusively addresses CFD engineers. CAD modeling, CFD automation and finally optimization – everything in a unified single GUI! 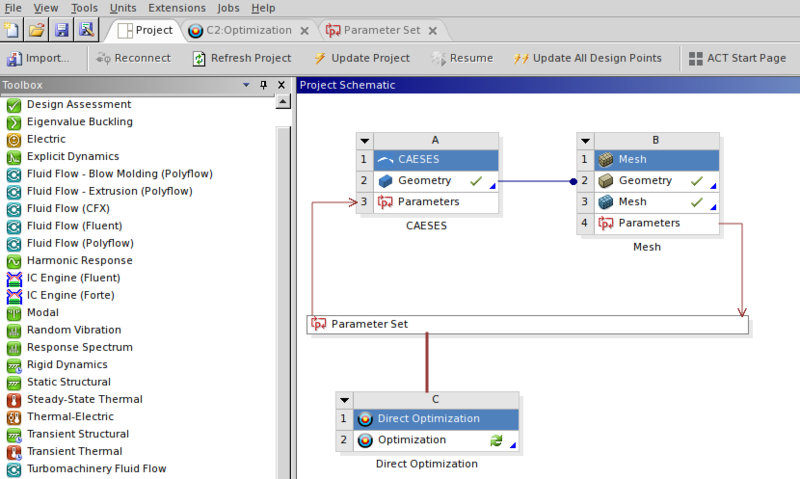 No hassle with error-prone scripting of complex tool chains, CAESES® users can really focus on their design task. Please find a short summary of the advanced optimization capabilities in this add-on brochure (PDF).